The US Food and Drug Administration (FDA) is considering adopting a blockchain-based solution to better track prescription medications, from creation to distribution, according to Engadget. The goals of such a program would be to ensure that hospitals and pharmacies are receiving and dispensing authentic medication and to more precisely track highly controlled substances — like opioids — throughout the supply chain. The FDA is currently soliciting bids from vendors to participate in a pilot program, with an aim to more broadly roll out a system in 2023. A blockchain-based prescription tracking solution would likely follow the model of other blockchain supply chain management tools. These sorts of systems typically use items such as RFID tags to identify the containers holding the goods to be tracked, recording the tags’ unique IDs to a distributed ledger to capture it on the blockchain and monitor the movement of containers. As goods are shipped to different packaging and distribution centers, their tags will be scanned, and their updated location and status will be recorded to the blockchain. Business Insider Intelligence recently spoke with Eric Piscini, the CEO of blockchain supply chain tracking startup Citizens Reserve, about the company’s solution, which can provide a number of useful lessons on how to approach a blockchain-based supply chain management solution. With prescription medication, blockchain would offer both critical benefits but also potential drawbacks that could push the FDA to other types of solutions. Beneficially, a blockchain-based solution would be decentralized and easily shareable. The extent of a blockchain solution’s openness varies case-by-case, but moving prescription medication from the factory to the hospital — and eventually the patient — involves a number of interested parties. The supply chain can include the pharmaceutical company, the purchaser, the logistics company, and FDA regulators, for instance. Blockchain is useful in this type of scenario, as it lets every stakeholder see what’s happening to the shipment — within the confines of regulatory permissions — while also creating an immutable trail to follow so that shipments are traceable, preventing them from going missing without explanation. But some blockchain solutions could face issues. One problem that public blockchains face is that as they grow larger, the amount of computing power needed to append a new entry to the ledger grows. That creates a need for more powerful hardware and also drives up energy costs. Citizens Reserve gets around this issue by employing a combination of public and private blockchains, as private chains have fewer entries and thus require less power, but such a tactic isn’t infallible. 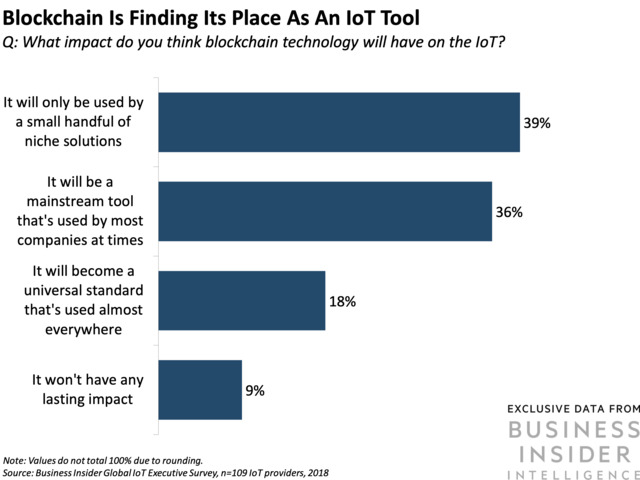 Also, a blockchain solution can only provide as much information as its sensors. While it can tell when a box tagged as transporting medication is received at a facility, it can’t do anything to verify the actual contents, which could undermine the whole goal of the system.